Location: West side of the A40 at the point where the road crosses the trackbed of the Foxdale branch by means of a bridge. Present state: Station building still extant and in use as a private residence. Notes: St. Johns had been served by a railway since 1873 when the Douglas to Peel line was opened by the Isle of Man Railway. In 1879 a further line opened from St. Johns to Ramsey by the Manx Northern Railway who opened their own station just to the west of the Isle of Man Railway station of the same name. This station probably consisted of nothing more than a simple wooden hut. In the early 1880's a new railway company was formed called thw Foxdale Railway Company. Their sole interest was to open a short branch from St. Johns to Foxdale some 2.5 miles to the south. A number of mines extracting minerals where located at Foxdale and a railway would make them more profitable. The Foxdale Company entered into an agreement with the Manx Northern Railway who agreed to operate the line. 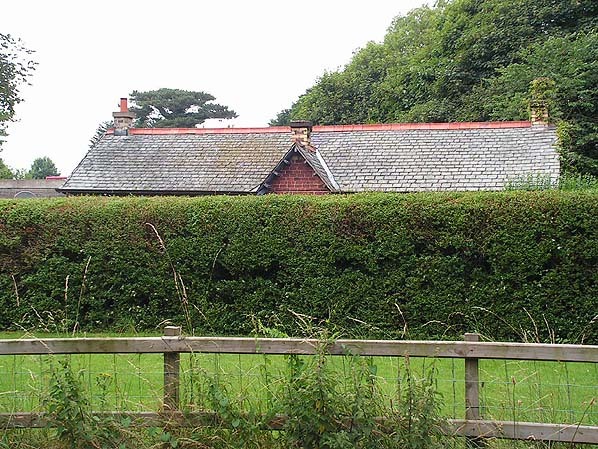 In 1884 the Manx Northern Railway moved its station to the alignment of the proposed Foxdale Branch. In 1886 a substantial brick built building and a single platform where constructed to provide better facilities. On the 17.8.1886 the Foxdale line opened. It made an end on connection with the Manx Northern Railway at the new St. Johns Station which became known as St Johns MNR. From the beginning some trains where operated from Ramsey through to Foxdale but most terminated at St. Johns. The branch had been constructed primarily for freight and that is what it was used for. In 1891 the Foxdale Railway Company went into liquidation. The Manx Northern Railway continued to operate it. On the 24.5.1905 the Manx Northern Railway was taken over by the Isle of Man Railway. They were much more interested in running trains into their own station at St. Johns and from this time services from Ramsey stopped using the MNR Station. Infrequent services to Foxdale continued to use it until 1927 after which they passed through the site and then reversed into the Isle of Man Railway Station. St. Johns MNR Station closed to passengers although it remained in use as a railway facility for many years afterwards. Passenger trains continued to run to Foxdale until 1943 when the service was withdrawn. However from 1940 many services had been substituted by a bus. Goods services on the branch until 1960. It was not lifted though until the mid 1970's. Isle of Man Railways Vol. 1 Pre 1873 - 1904, Vol 2 1905 - 1994 & Vol. 3 by J I C Boyd - the definitive history of the Isle of Man railways - Oakwood Press. Click here for a comprehensive list of books, magazines and videos about the Isle of Man railways. To see other stations on the Douglas - Peel line click on the station name: Quarter Bridge, Braddan Halt, Union Mills, Crosby, Ballacraine Halt, St. Johns & Peel. 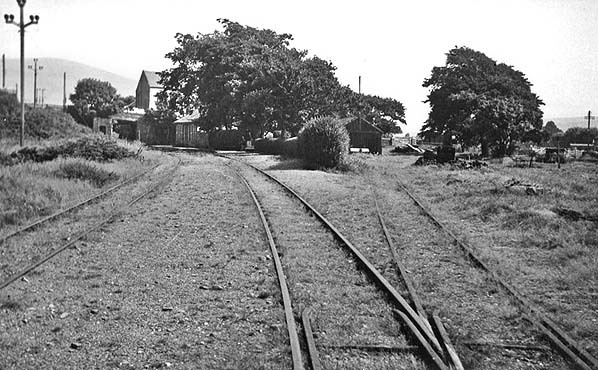 St. Johns (MNR) station is seen on the left in 1947 at the start of the Foxdale branch. 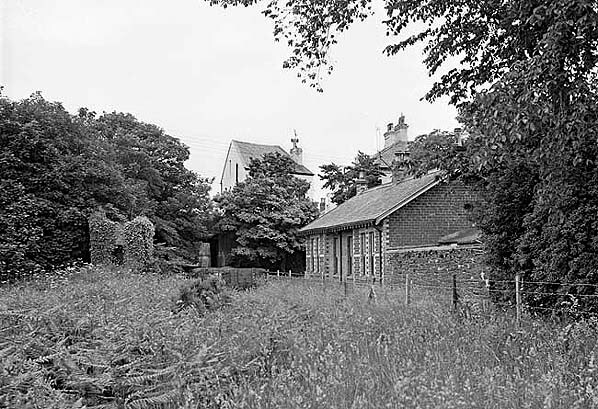 The St. Johns goods shed can be seen in the centre. To the right of the goods shed a level crossing gate can be seen, beyond this is the IOMR station.